ezRecipe Design is the full-featured beer recipe design tool that is powerful and easy to use. Built from the ground up with the power and features needed to design the most challenging recipes. While letting you focus on brewing beer and not on learning complicated software setup. Now you can create, edit and save your recipes all in a single Excel spreadsheet. For added convenience, ezRecipes include all the ingredients, brewing notes, and settings needed to brew each recipe perfectly every time. Select a perfect combination of grains, adjuncts and hops from a built-in list of ingredients. Then change the values as needed to match the ingredients you have on hand. Or choose to add your own ingredients to the built-in list for use when designing future brews. Either way, ezRecipe gives you the flexibility to save the ingredients and settings needed to brew that recipe again and again. ezRecipe makes sharing recipes with other ezRecipe users easy to do. Export a favorite recipe as individual XML file then send it to another ezRecipe user to import. Once imported they will see the recipe just as you did when you exported it. The imported recipe can then be saved within their own copy of ezRecipe and selected for use at a later time. Brewing System Section: Displays batch volumes with settings for efficiency and mash temperature for the current recipe. Supports both 'kettle' and 'fermentor' efficiency calculation options. BJCP Style Section: Choose from dozens of beer styles to base your new recipe on. Style guidelines provide recommended ranges for color, bittering and alcohol levels. Recipe Detail Section: Predicted recipe values change based on unique combinations of ingredients and brewing system settings. Recipes can stay within recommended ranges unless you're brewing something new. Grain & Adjunct Section: The type and quantity of grains used in the mash can be selected from a built-in list. You then have the option to use the default color and extract potential values or override them with values of your own. This also applies to custom DIpH values entered by advanced users. Either way, values entered in this section are saved with the recipe and will be reloaded when the recipe is selected. Adjuncts are added to the boil kettle and have no affect on the mash. Water Property Section: Conversion optimization occurs in the 5.2 to 5.6 mash pH range. Distilled water combined with base malts typically have an average mash pH in the 5.6 to 5.8 pH range. Brewing salts modify the flavor and mineral content of brewing water. Lactic and Phosphoric acid reduce pH and Baking Soda and Slaked Lime are used to raise pH. 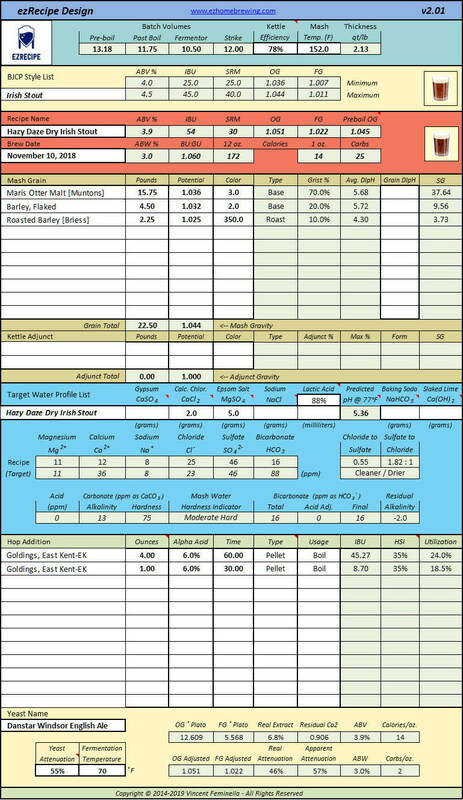 Displayed of recipe water property, mash analysis and pH prediction. Hop & Utilization Section: Select the types of hop to use from a list of popular hops. Then enter the weight, type and usage for each hop selected. The default alpha acid percentage can be used or overridden with your own values. The values entered in this section are saved with the recipe and will be reloaded when the recipe is selected. Types are pellet, whole and extract used in boil, whirlpool and dry hop. Yeast & Attenuation Section: Enter the name and attenuation rate of the yeast used with the recipe. Most types of yeast have a 65% to 85% attenuation rate. The actual attenuation rate varies based on fermentation conditions and beer gravity. Attenuation rate and fermentation temperature influence final gravity.